Wildlife and birding in the Po Delta dreamy wood. Mesola wood is a nature reserve on the Po Delta, not far from Ferrara (between Goro, Codicote and Mesola). 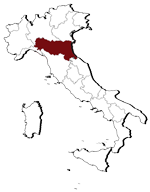 The Gran Bosco della Mesola covers an area of 1,058 hectares which represent the remains of a woodland complex, once much larger, which originated around the year 1000. The altitude ranges from – 1 to +3 m m.
The Delta region is a lonely and mysterious land of legends, traditions and swamps.